I’ve been to other Pho Hung locations including the one in Chinatown and the other in the Annex, although I’m not sure if the latter exists any more due to redevelopment projects in the area. The one in the Junction may not be of the same owners as I have yet to see the location listed on their website. It was much nicer renovated than the other places I’ve been to and they had fancier shaped plates. 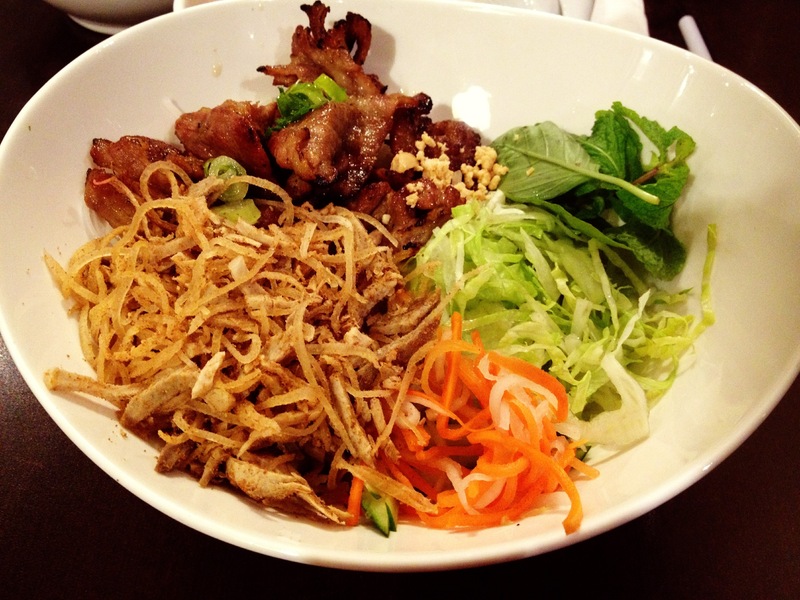 The prices are very similar to other Pho locations with most meals being between $6-9. My favourite so far has been their Hue-style noodle soup. 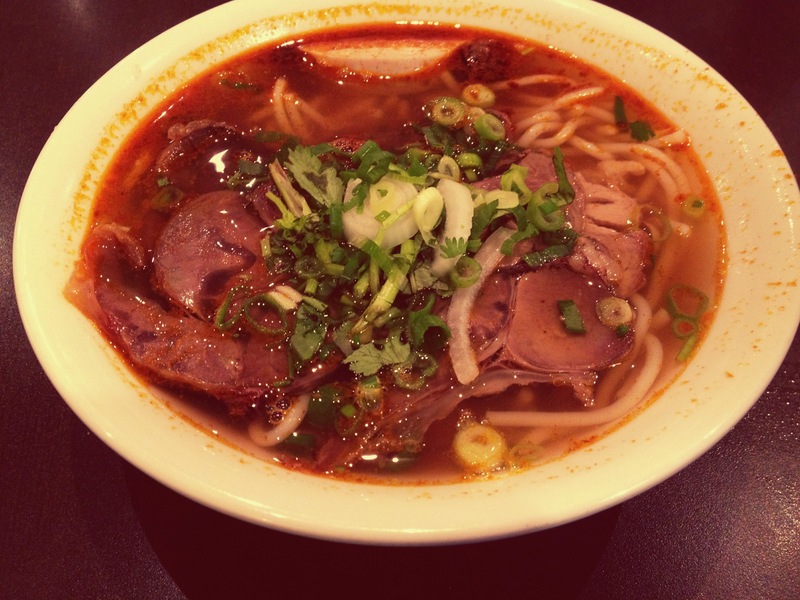 It has a bit of a kick to it (as indicated by the red broth), some thicker noodles. It’s also packed full of meat. I ignored the fact there was a pig foot in my soup though. That thing is too hard to eat. Otherwise, its so nice to have as the weather gets colder. 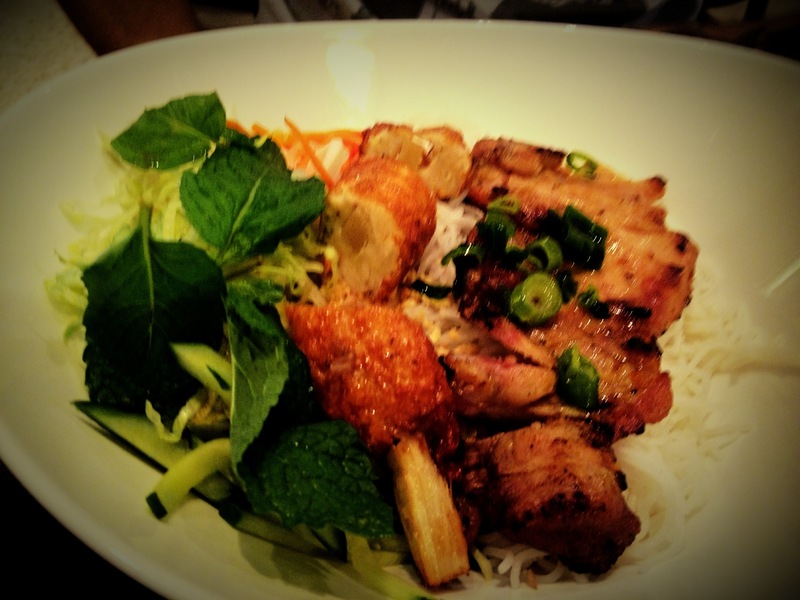 We’ve also tried the vermicelli dishes. The portions here are a bit smaller than normal, but the meat is always flavourful and there is plenty of little shredded peanuts. They don’t skimp on the bowls of fish sauce either (or any of the sauces for that matter). Me and Nash are used to places with way bigger portions, so sometimes we wander around for desert after. I have yet to try just regular Pho here, but I am sure I will soon. The food is cheap and good here, but don’t expect the normal sized portions! I’ve been to several pho places, and every time they bring me a gargantuan amount of pho. I’m seriously talking about easily, EASILY 4 servings-worth of pho. Is this normal? What’s with the huge portions? I always feel guilty leaving so much behind, but I can’t always take it with me, and it just doesn’t taste as good reheated anyway.